Where you a fan of the very popular French comic books by Hegé; Tintin?! 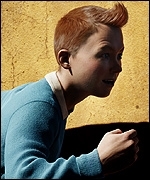 Well, Steven Spielberg and Peter Jackson decided to adapt Tintin in a performance-captored 3D movie (meaning real actors are playing the characters), enhanced with CGI. 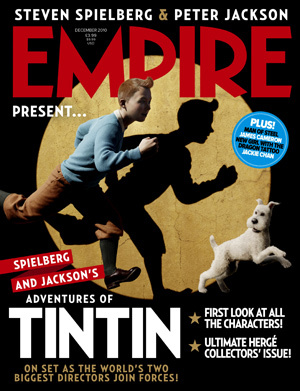 The Adventures of Tintin: The Secret of the Unicorn is coming our way next October and here are the first images of our favorite red headed character, his dog snowy and, let’s not forget, Captain Haddock as seen on the new edition of Empire Magazine! FYI — the film stars Jamie Bell as Tintin and Andy Serkis as Captain H. Simon Pegg and Nick Frost as Thompson and Thomson and Daniel Craig as Red Rackham. It also features Cary Elwes, Toby Jones, Mackenzie Crook and Daniel Mays. For much, much more from Spielberg, Jackson and their entire cast, pick up the new issue of Empire, on sale TODAY. Or better still, order your copy online now!